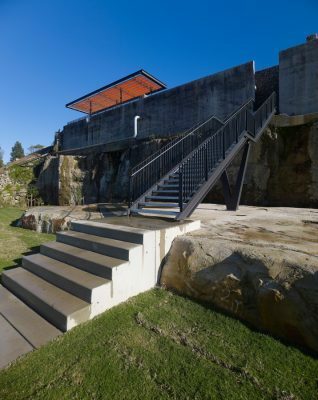 The park reveals and draws interest from the abusive history of the site by retaining the cliff faces where ballast was quarried for the early settlers as well as retaining the footprints of the storage drums from when the site was more recently used by Caltex for lubricant and oil storage. 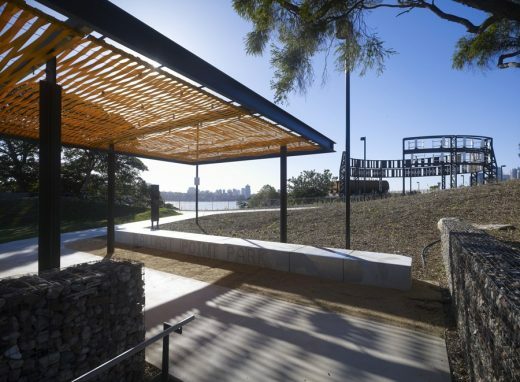 Further corruption of the site is avoided with the site’s present transition to foreshore park and only minimal contemporary interventions are added to help order and reveal the interest of the disfigured landscape. 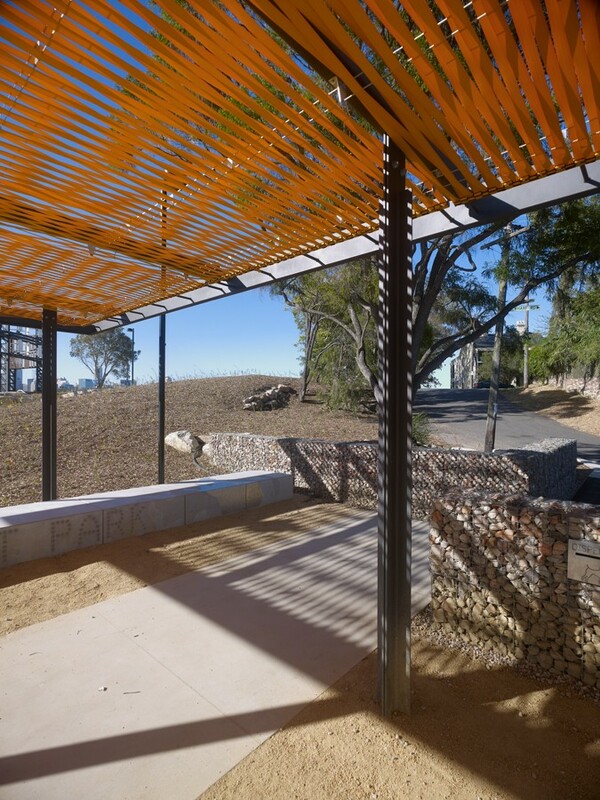 structures that complement the remnant site features through their materiality and contemporary industrial aesthetic. The architectural components include two amenity buildings that feature light filled naturally ventilated spaces and a series of finely crafted shade structures that bring a fine-grain textural quality to this otherwise post industrial context. 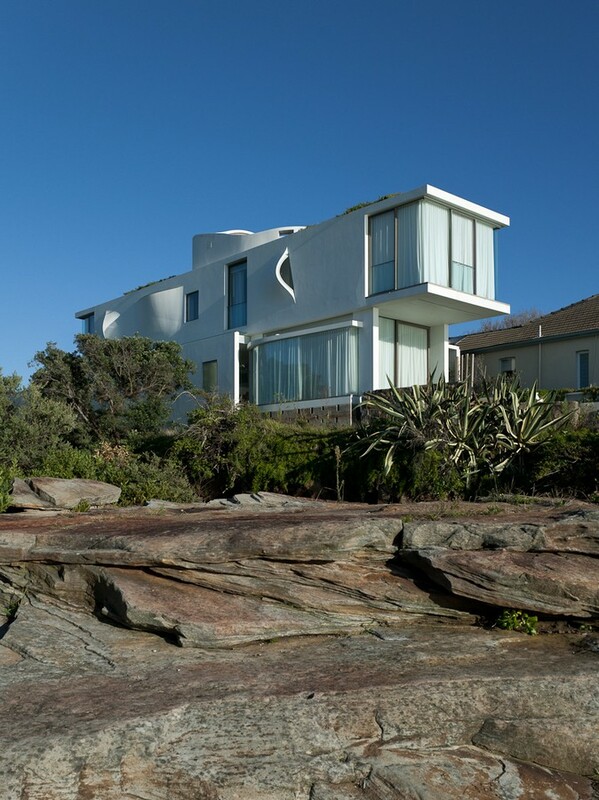 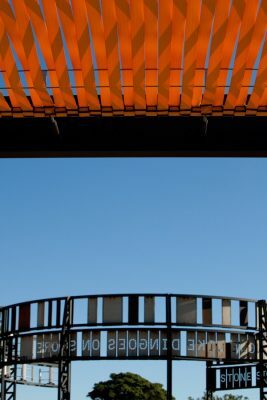 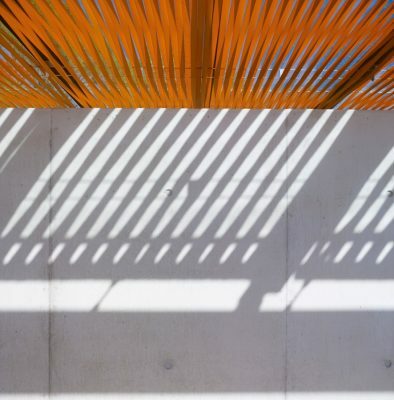 The architectural expression sits finely between abstraction and tectonic expression allowing the eye to appreciate the shade structures as delicate textured ‘kites’ from a distance and close up, understand the construction and structural forces at play. Nothing is concealed. 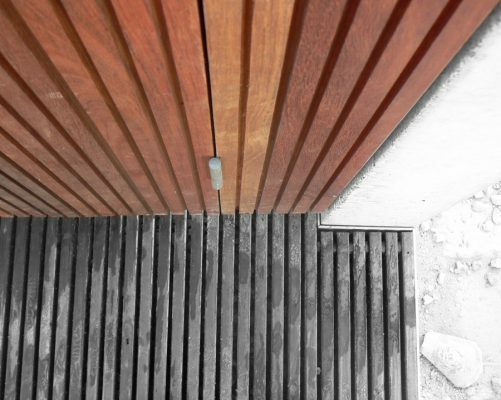 All details are designed to add to the ‘craft’ of the building. 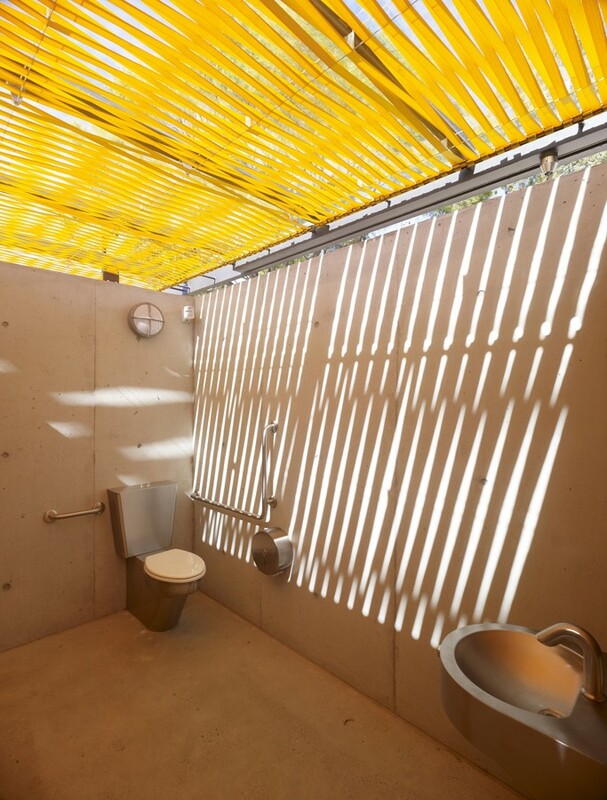 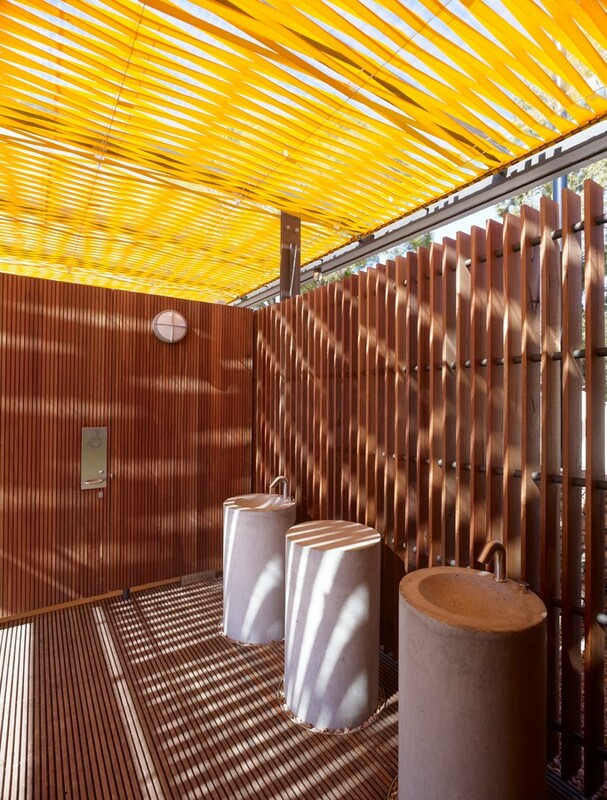 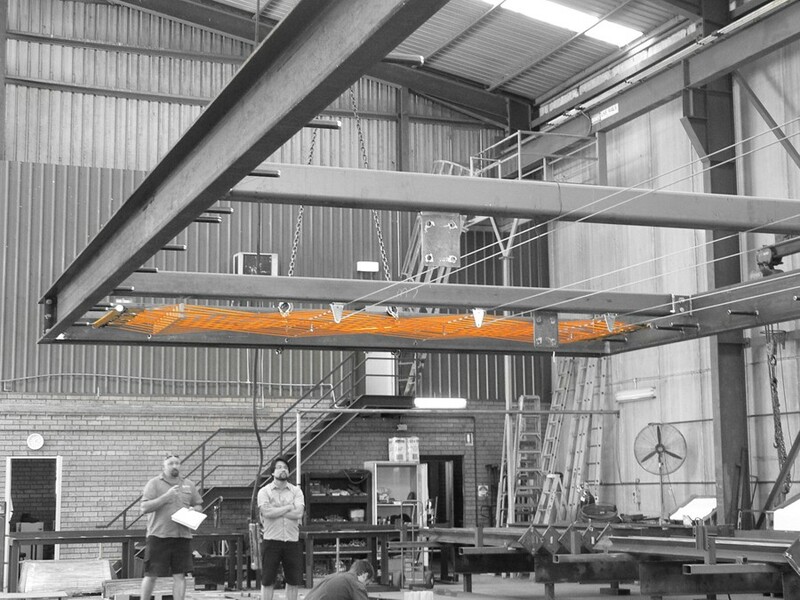 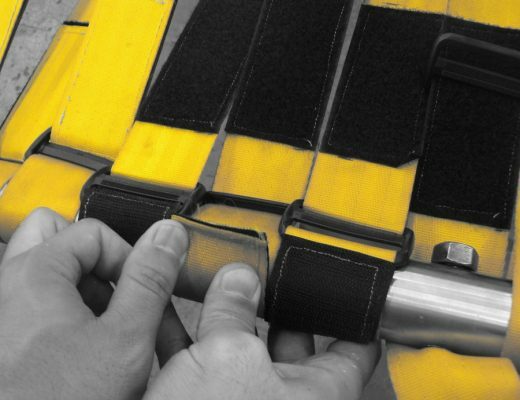 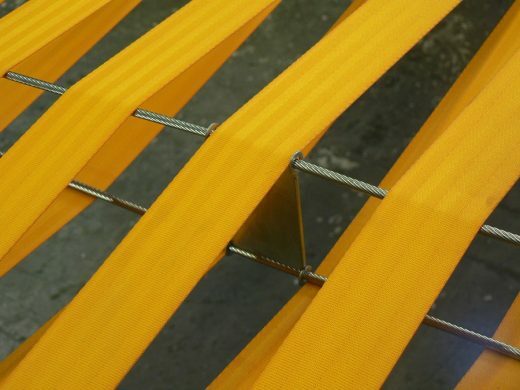 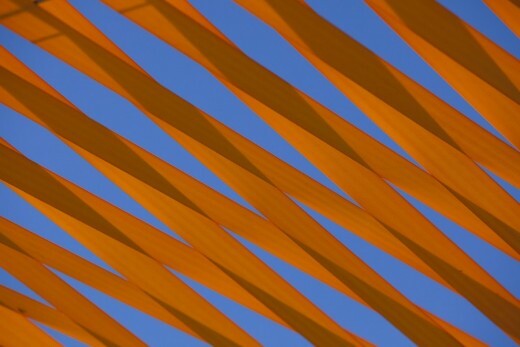 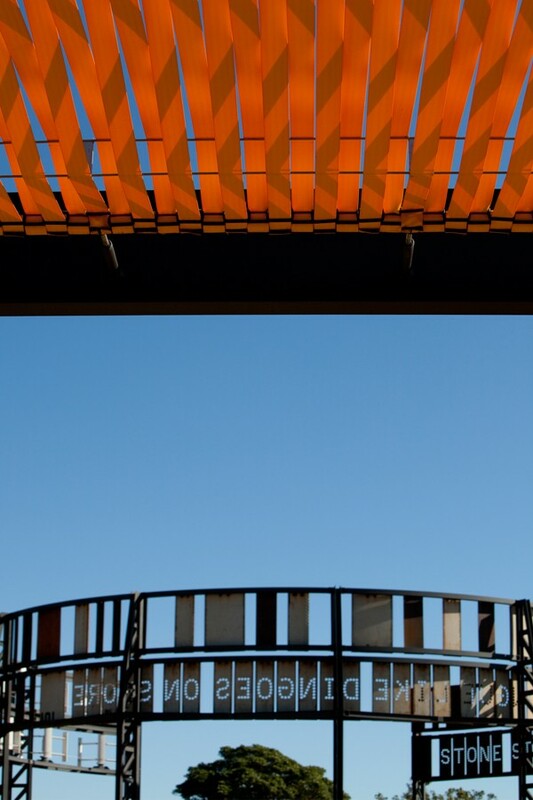 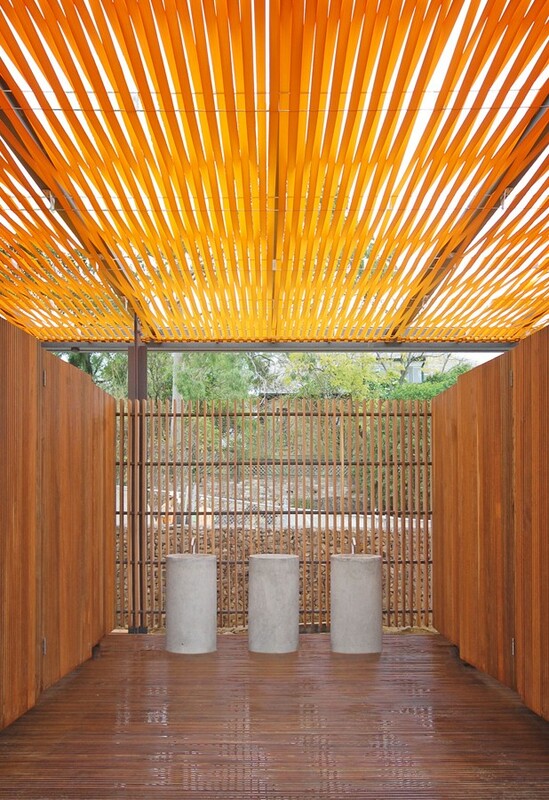 The shade structures themselves are formed with bright yellow recycled seat belt webbing. 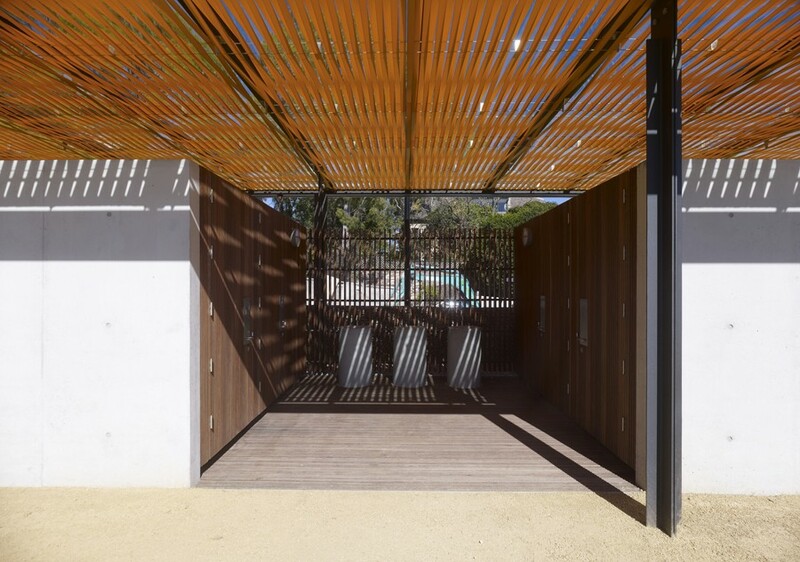 The webbing is woven in an interlocking pattern to allow full shade in the middle of day and dappled light in the morning and late afternoon. 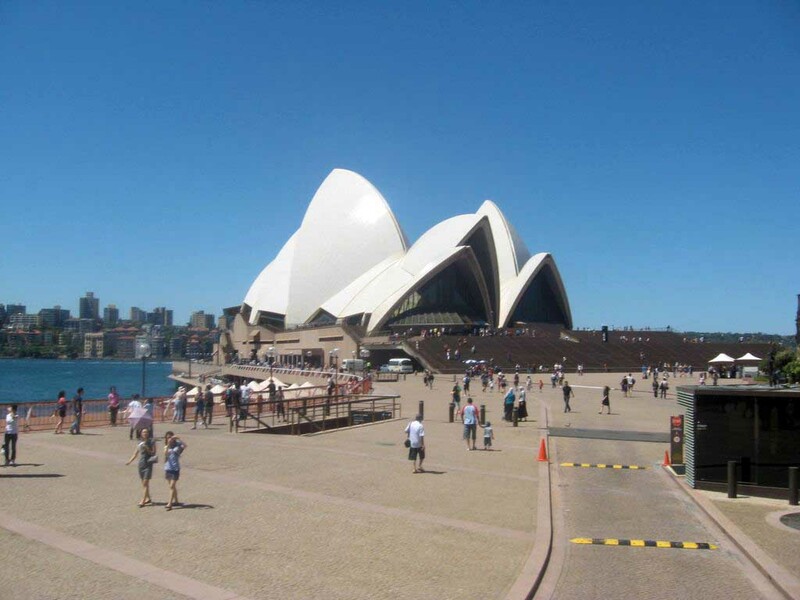 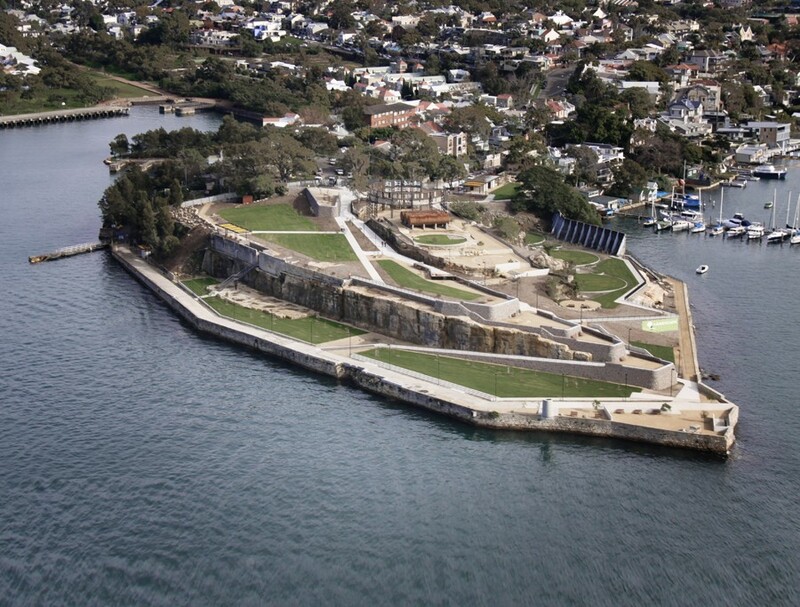 Ballast Point Park is located on a prominent headland overlooking Sydney Harbour. 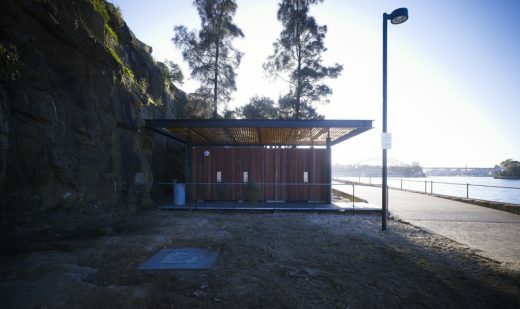 A former Caltex lubricant and oil storage facility, it sits at the tip of the suburb of Bichgrove in Sydney’s inner west. 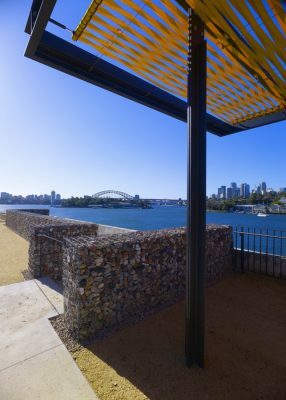 The restoration of Ballast Point to a new public harbour-side park, reveals and draws interest from the history of the site by retaining the cliff faces where ballast was once quarried by the early settlers, as well as retaining the footprints of the storage drums which previously occupied the site. 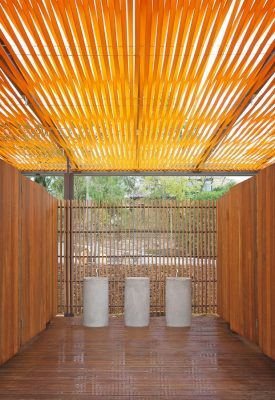 The challenge was to establish an appropriate design language that responded to the site’s history and past abuses whilst celebrating this new layer to its story. Our strategy addresses these issues by retaining selective components of past layers within a composition of recycled materials and finely crafted detailing underpinned by ESD principles, to create a park that speaks of the future. 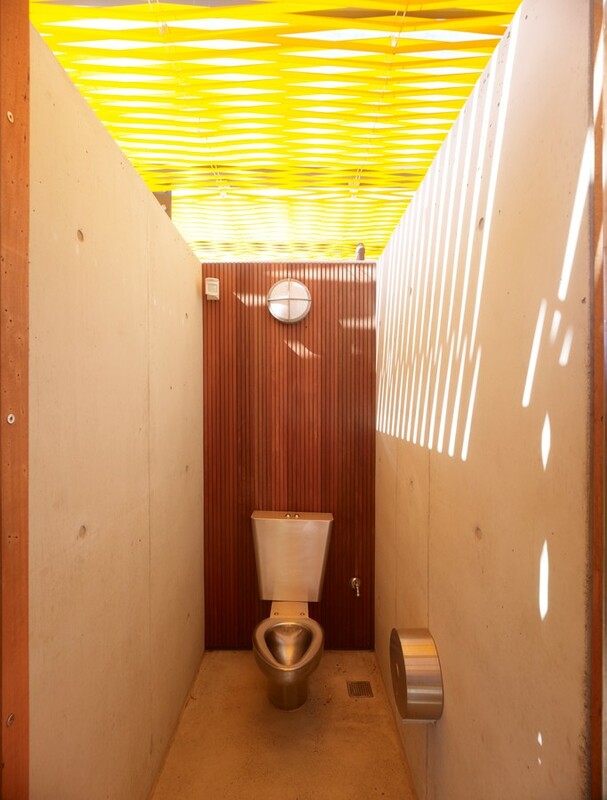 Our objective was to explore the use of recycled materials in all design elements in order to limit our use of newly extracted raw materials. We did not want to destroy another landscape in order to rebuild this one. Retaining walls are built from recycled site demolition materials, all concrete used is a recycled mix. All timbers, aggregate, soil and mulch are recycled. This composition of recycled materials is held together by an astute attention to detail which elevates it above the pragmatic to the unique. 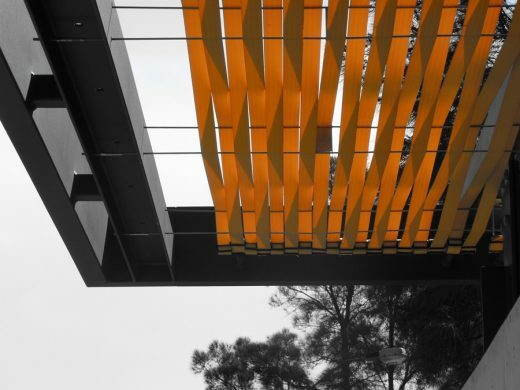 The park challenges us to reassess the potential for using recycled materials to create high-end products and reduce our draw-down on new raw materials. 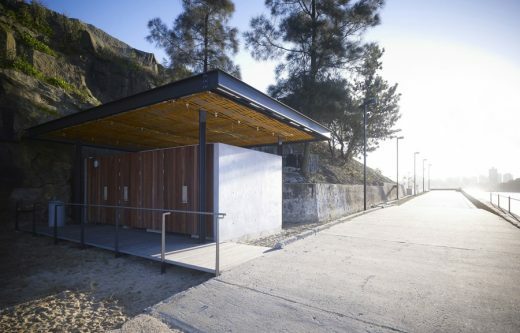 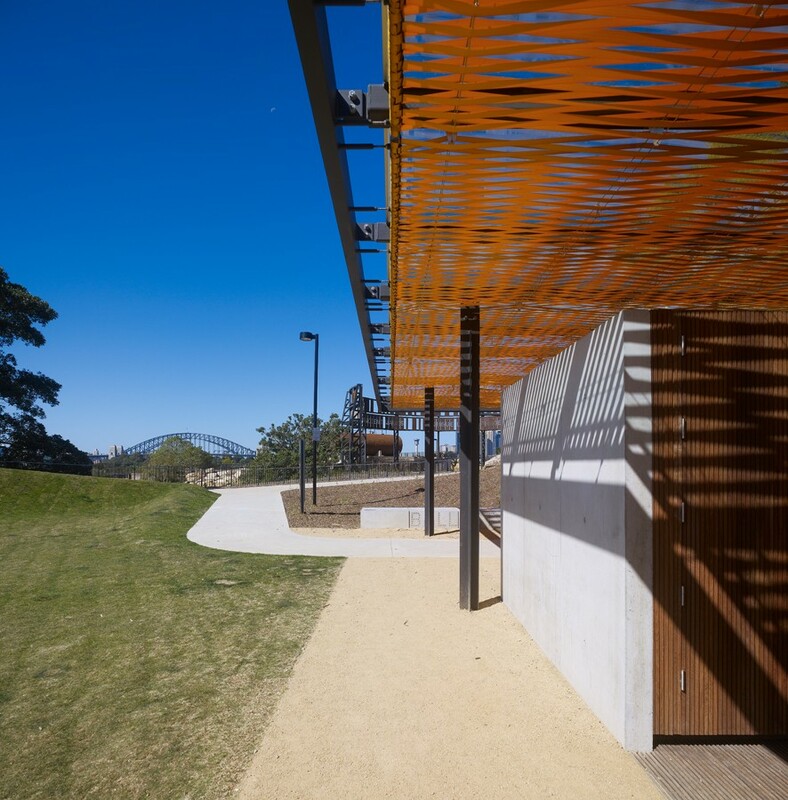 The architectural programme for the park redevelopment includes two amenities buildings and a cliff-top shade structure. These architectural interventions work within this overall philosophy by layering the site with contemporary structures that complement the remnant site features through their materiality and industrial sensibility. 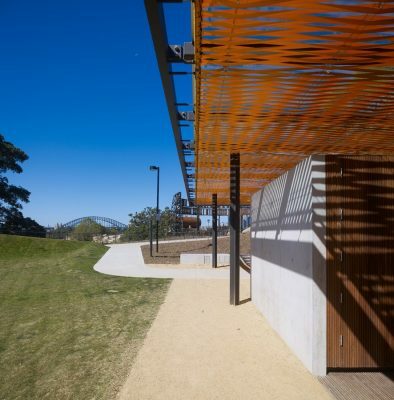 A series of finely crafted shading devices were developed as the key architectural device to link the structures around the park, which in turn bring a fine-grain textural quality to this otherwise post industrial context. 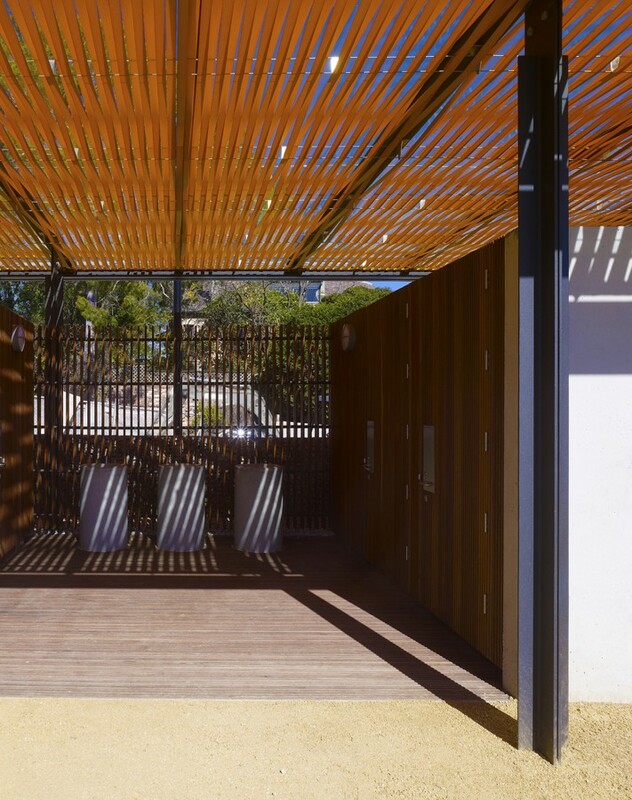 These structures provide for light-filled naturally ventilated spaces with an intriguing play of light and shadow for both the amenities blocks and the shade structure. 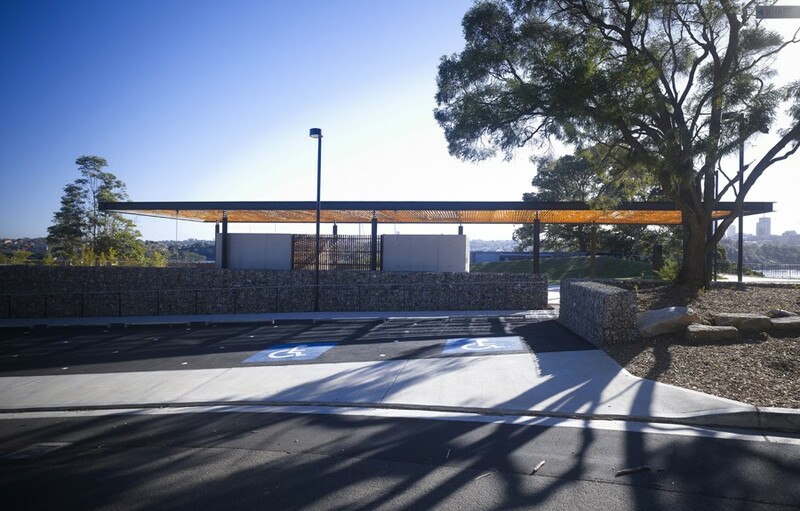 The shading canopy is formed with golden yellow seat belt webbing complimenting the richness and colour of the sandstone cliff faces and cuttings. The webbing is woven in an interlocking pattern to allow full shade in the middle of day and dappled light in the morning and late afternoon, offering an ever changing play of light and shadow animating the structures during the course of the day. Close up, one can ‘hear’ the structures as wind blowing over the structures causes minor vibrations in the webbing. In addition, one is offered an understanding of the construction and structural forces at play expressed through the tensioning system developed to form the woven canopy, alluding to the mechanics and joy of nautical crafts on the harbour. 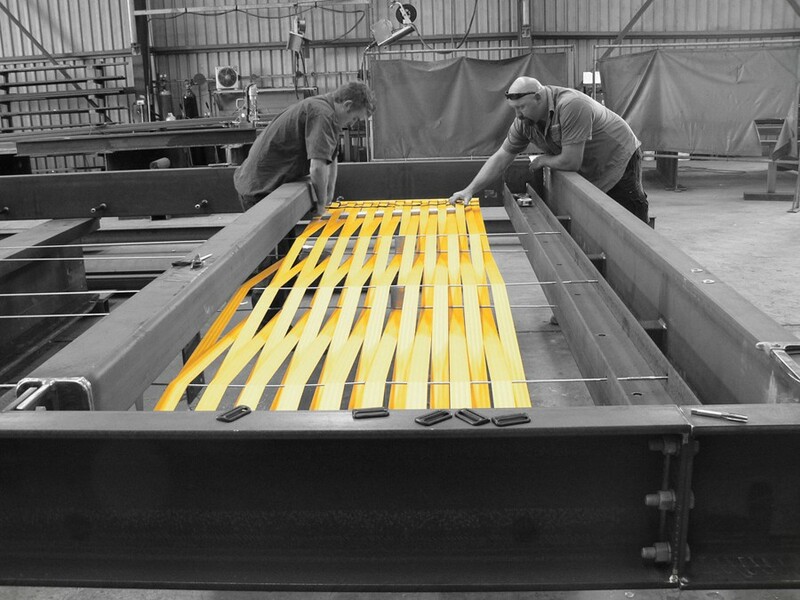 finely crafted elements into the composition, such as the bespoke pre-cast wash basins. distance, the eye to appreciate the shade structures as delicate textured ‘kites’ playing in the wind. 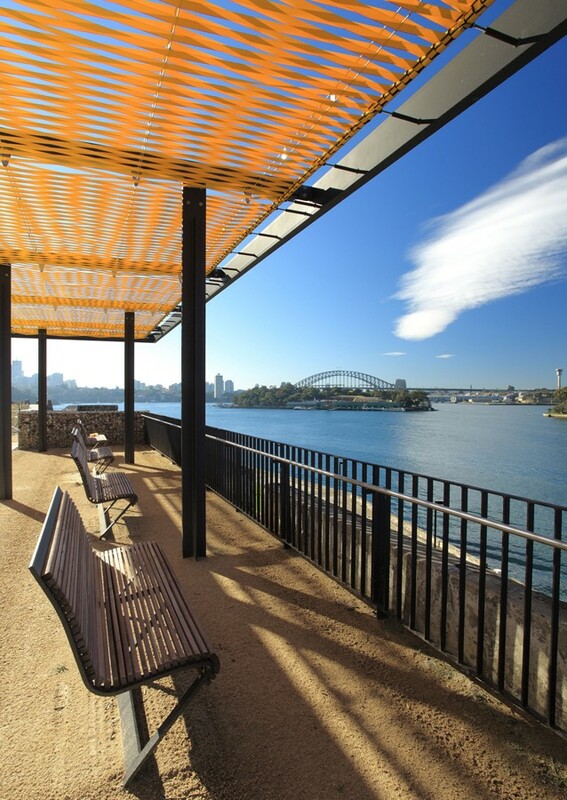 Ballast Point is located in Birchgrove at the tip of the Balmain Peninsula in the Municipality of Leichhardt in Sydney, New South Wales, Australia.